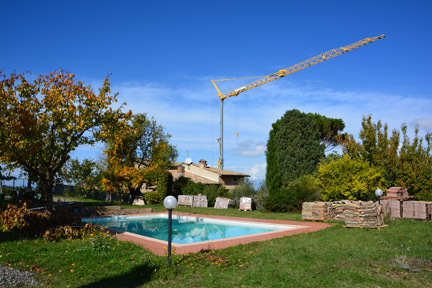 “This destination is not on the digital map,” my GPS announced, when I entered the coordinates for Cerbaiona, but we knew the destination was in sight when we saw the huge crane looming over the construction. The buildings are in full flight of reconstruction with a two year project to renovate and extend the cellars, improve the vineyards, and plant a new vineyard. Cerbaiona is one of the mythic producers of Brunello, created when Diego Molinari left Alitalia in 1977, and instead of flying planes, began making wine. Winemaking might more accurately have been called idiosyncratic rather than traditional, with vinification in cement tanks with fiber glass lining, and aging in very old botti. But the wines won worldwide acclaim. Cerbaiona was a manor house, and the east-facing vineyards just below the house are adjacent to the La Cerbaiola estate. Cerbaiona was purchased in 2015 by a group of investors led by Matthew Fioretti, a Californian who spent some of his education in Italy, and started in wine by importing Italian wines into the United States. Now he is living at Cerbaiona and managing the massive reconstruction. “I thought we could do it one step at time, but I realized we would have to do everything at once,” Matthew explains. Just below the house a 1 ha olive grove has been replanted with vines, and an additional vineyard may be added at slightly higher elevation (the estate is at 450 m). “The Molinaris were the ultimate garagistes, making some wine in the basement,” is how Matthew describes the previous situation. 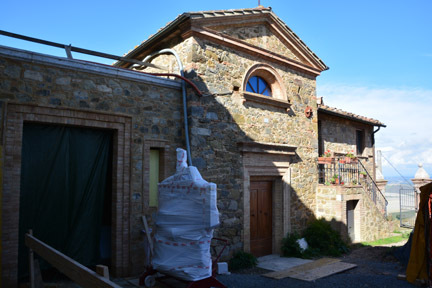 Working around the construction, the current vintage is being made in new equipment, with wood fermenters and new botti. So there may be a bit more wood showing for the next year or so. Tastings of the Rosso and Brunello presently maturing in botti show the characteristic combination of density with elegance. Will there be any permanent change in style? “Well, it’s the vineyards that count,” Matthew says, but there will be better handling of the fruit, so look for increased purity in the wine. 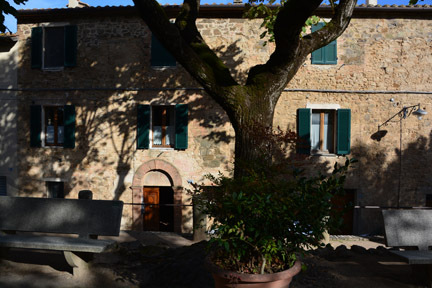 The adjacent vineyard is La Cerbaiola—Diego Molinari used to say that Cerbaione and Cerbaiola were part of the same estate a century ago—but to visit you don’t go to the winery, but to the cellars in Montalcino. The tiny scale of production at La Cerbaiola is indicated by its aging cellar, underneath the family house in Piazza Cavour in the town of Montalcino: it has 6 botti of 20 hl. That’s the total production for one of the mythic producers of Montalcino. 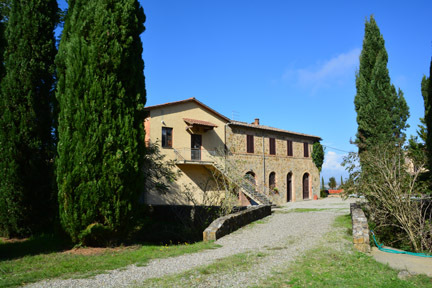 The property at La Cerbaiola, three vineyards totalling 4 ha in a 20 ha estate, has been in the Salvioni family for three generations, but winemaking is relatively recent. “Our story started in 1985 when my father decided to make wine, says Alessia Salvioni. Guilio Salvioni’s first vintage in 1985 was an immediate success: the traditional approach, using indigenous yeast, botti (albeit of medium size), and lack of filtration, marked the wines firmly in the artisanal camp. The entire vineyard is declared for Brunello, but some is declassified to Rosso when the crop is unusually large or there is a poor vintage. There are certainly ups and downs in production. In 2012 there were 12,000 bottles of Brunello, in 2013 there were only four botti (about 10,000 bottles), in 2014 the entire crop was declassified to Rosso, and in 2015 there will probably be 15,000 bottles, all Brunello. The wines have that combination of full flavor and density, yet elegant expression, that marks the vineyards of Cerbaiola and Cerbaiona. And then for something completely different, I went to Valdicava, in the northeast of the appellation. Well, not completely different: a sense of Déja Vu all over again, as we had to go a long way round to the back entrance, because the front was blocked by massive reconstruction works. Driving through the extensive estate on the way to the winery, we passed the Madonna del Piano, a small building that used to be a church, and which is just above the famous 8 ha vineyard of its name. The work is to build a new winery, a stable for the racing horses (another interest), and a tasting room. The present winery is small facility, packed with equipment and botti. One of the older established producers in Montalcino, Valdicava was turned into something of a cult wine after Vincenzo Abbruzzese took over in 1987. The estate was founded by his grandfather, Bramante Abbruzzese, in 1953. Valdicava was a founding member of the Consorzio, and has been bottling wine under the Valdicava label since 1977 (previously they carried a generic description from the Consorzio with the winery’s name). The vineyards occupy only a small part of the 135 ha estate, which extends into the famous Montosoli hill, where the most powerful wines of Montalcino are produced. 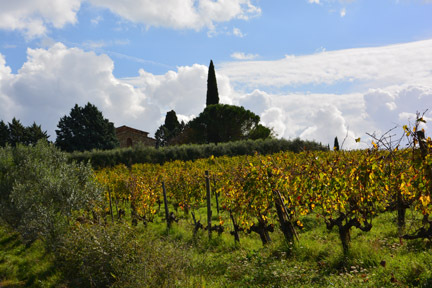 Valdicava produces three wines: Rosso (from the youngest vines), Brunello, and the single vineyard Madonna del Piano Riserva, produced only in the best vintages in small amounts (around 800 cases). Wines are aged only in botti, which are natural wood with no toast. Botti are replaced after fifteen years, and Vincenzo buys the wood and stores it in advance. This entry was posted in Wine and tagged Brunello di Montalcino, Cerbaione, Diego Molinari, Guilio Salvioni, La Cerbaiole, Modonna del Piano, Rosso di Montalcino, Valdicava by Benjamin Lewin. Bookmark the permalink.